Gráinne Ní Luasa is a 4th year BMus student at CIT Cork School of Music. She began her piano studies with Gabriela Mayer at the age of six, later studying with Jan Čáp and, currently, Mary Beattie. From a young age, she has been a regular prizewinner at local and national competitions, and was last year’s winner of the CIT Cork School of Music Advanced Recital Competition. In 2013 she featured as part of an RTÉ Lyric FM broadcast showcasing young musicians. In April of this year she performed in the RDS as part of the Rising Stars concert series. Gráinne is a versatile musician, whose repertoire ranges from early to contemporary. 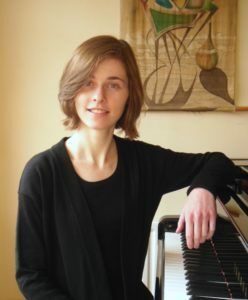 In addition to solo playing, she enjoys collaborative work and regularly performs as a chamber musician and accompanist on piano, harpsichord and organ. As an orchestral pianist, she has performed Stravinsky’s Symphony in Three Movements with SinfoNua, under conductor David Brophy. Gráinne has had masterclasses and lessons from many renowned pianists, including Pavel Nersessian, Ewa Pablocka, Barry Douglas, Anton Voigt, Philip Martin, and Finghin Collins. She has also attended the Chethem’s Summer School for Pianists on several occasions.